Sharing custody of a child after a relationship or marriage has ended can be frustrating and emotional. It’s important to exercise your rights as a parent while respecting those of the other parent. Focus on the best interests of the child to make shared custody work. Set ground rules. This is necessary if you’re going to get anything done with the other’s agreement. Share custody fairly by deciding a basic set of ground rules that each of you will follow when caring for and disciplining the child. Establish a set bed time, homework time and forbidden and permitted television shows, video games, activities and snacks. These ground rules will help ensure stability for the child no matter which parent’s house they’re at and give parents a common ground to work from. Work out shared custody by writing it out on paper and developing a calendar system that combines both of your schedules along with the child’s scheduled activities. Map out who needs to be where and when. This will help you anticipate any scheduling conflicts and ensure that you both stick to your responsibilities. It’s important to keep your contact information with the other parent current to share custody equally. This will ensure that you will be able to reach the other parent in case of an emergency or change in schedule. Be sure to notify the other parent if your mailing address, email address or phone number changes and make sure he or she does the same for you. It’s reasonable to assume that there will be arguments or disagreements about the custody arrangement, but make sure these happen away from the child. Don’t involve your child in the hostility or frustration you have toward each other. Take your argument in the other room so the child doesn’t feel like he or she is in the middle or that is the cause of your fight. Everyone’s schedule changes, so be a little flexible if last-minute changes happen occasionally. Try to be understanding and find a way to work things out. This will foster a sense of cooperation between the two of you. Be aware of all the details of your shared custody agreement and stick to them when sharing custody. You should be familiar with the number of hours you’re granted per week or month and any restrictions on traveling with the child. Be sure that you still get your allotted number of custody hours or visitation time and the other parent respects your rights in the custody agreement. 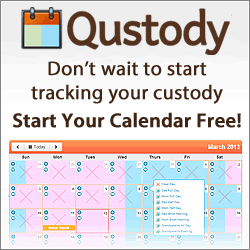 Try to avoid disrupting the child’s activity schedule when you share custody. Make sure the child still gets to participate in all regular activities and the custody agreement doesn’t change his or her routine.